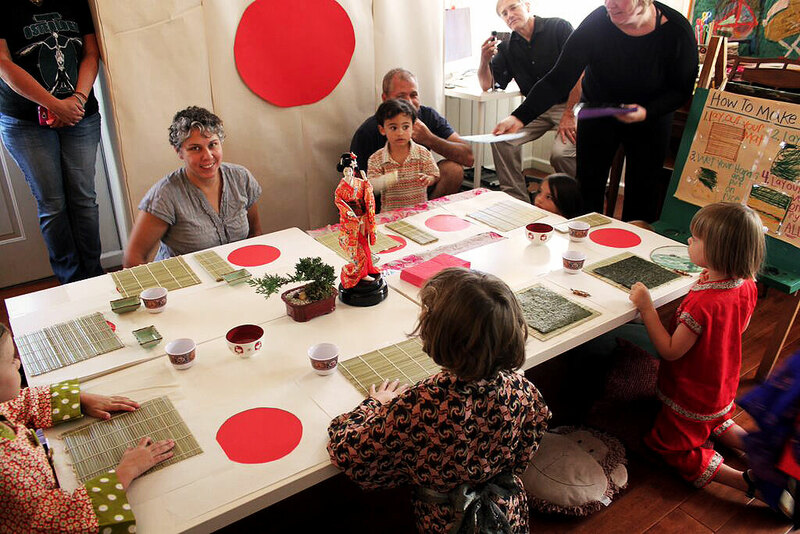 A Japanese birthday party is a fabulous alternative to the standard princess or pirate birthday party. 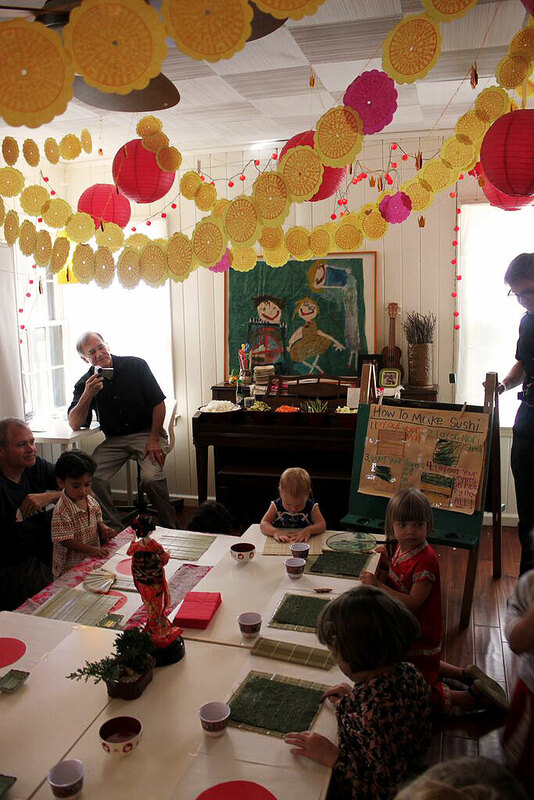 A couple of years ago my good friend and artist Annie Ferris had a Japanese-themed birthday party for her daughter and was kind enough to share the photos. The girls are 4 years old, proving there’s no age limit to having a fun and educational birthday party. I love how Annie managed to throw together a totally immersive experience while maintaining a down-to-earth vibe. 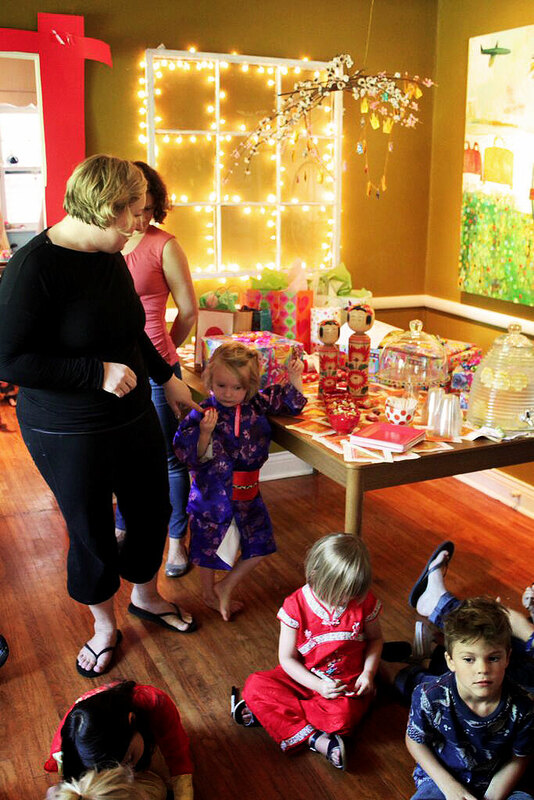 Here are some of my favorite features of her daughter’s Japanese Birthday Party. 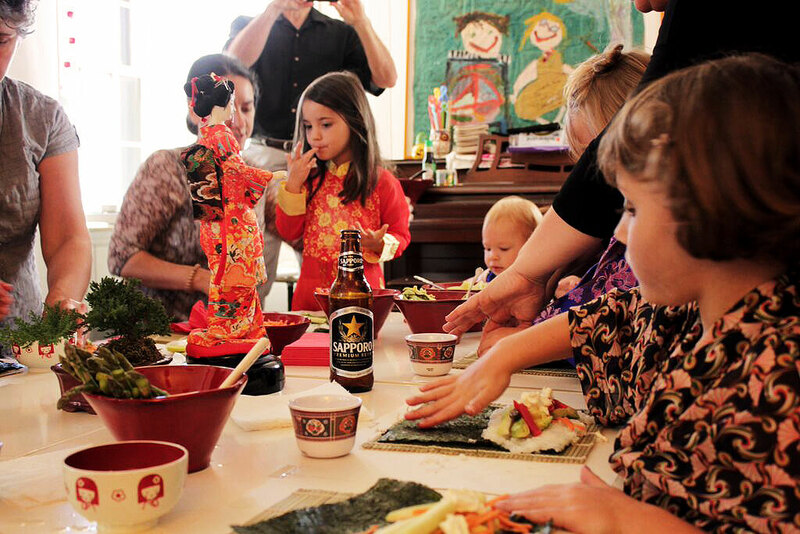 Ava still asks to make homemade sushi and this party is one reason why. Set up several low tables – kids craft tables or coffee tables work well – and use cushions for seating. Not only is this set up very Japanese, but it’s also easier for wiggly little ones to manage. 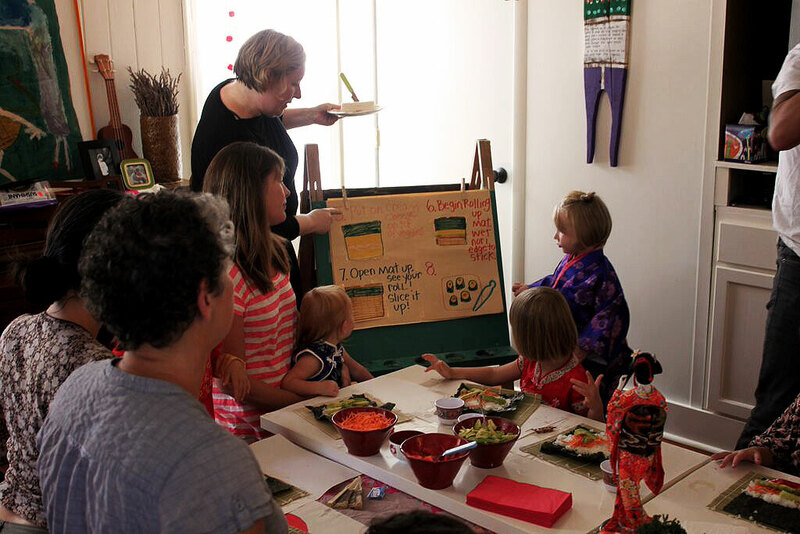 Annie also featured an easel at one end of the room with step-by-step instructions for rolling the sushi. She drew the instructions in marker – four per sheet. Annie and her daughter went through the instructions slowly, making sure everyone had completed each step before moving on. Even the youngest sushi roller was able to participate with great success. 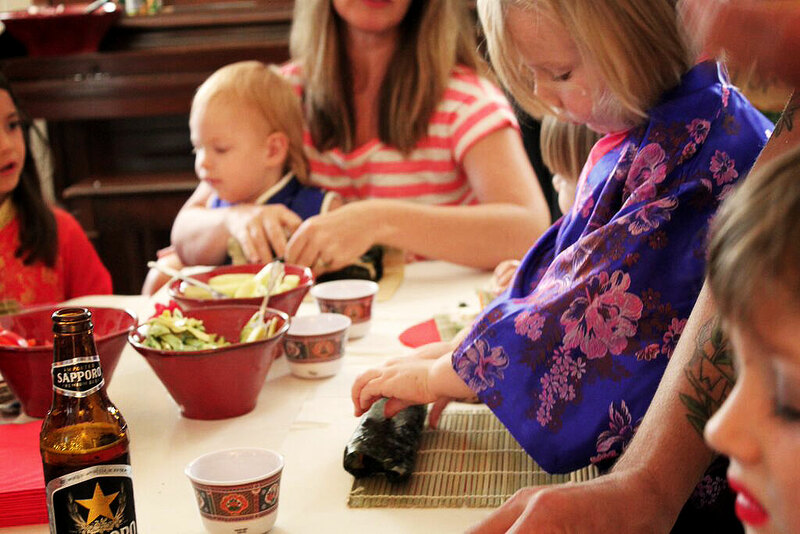 Since this party was for little people, Annie provided a few plastic serrated lettuce knives for slicing the sushi. While the knives were quite safe, pressing the knife straight into the rolled sushi didn’t work – however if the rolls were tight and I glided the knife gently back and forth it did work. A few bottles of Sapporo were on hand for the adults. Cheers to that! It might look like a spicy ball of wasabi, but this was the sweetest treat of all! 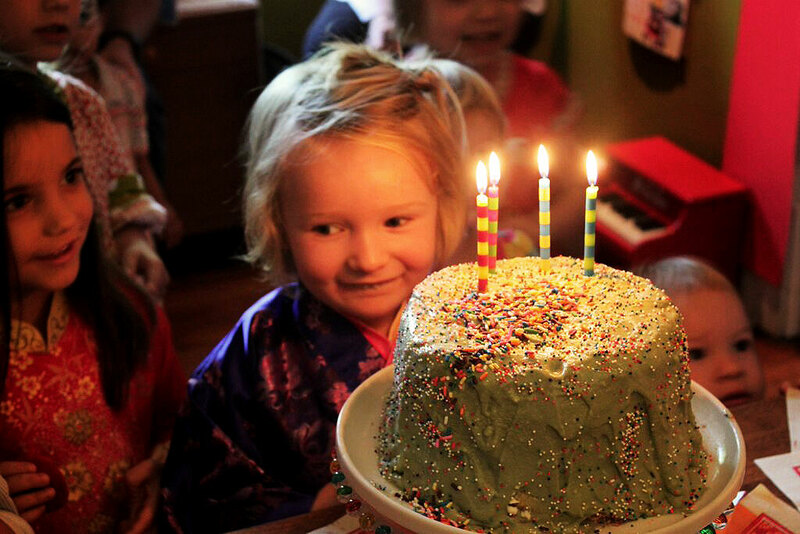 Green frosting and sprinkles made this little girl’s homemade vanilla cake stay on theme. Other sweets were found in the children’s goodie bags – such as Pocky Sticks and hard candies – all found at the local Asian market. While I’ve provided links to online shopping, most of these items were found at the local Asian market. The invitations came in little Asian-style takeout boxes (they were polka dotted) – these can be found at many craft stores or online. 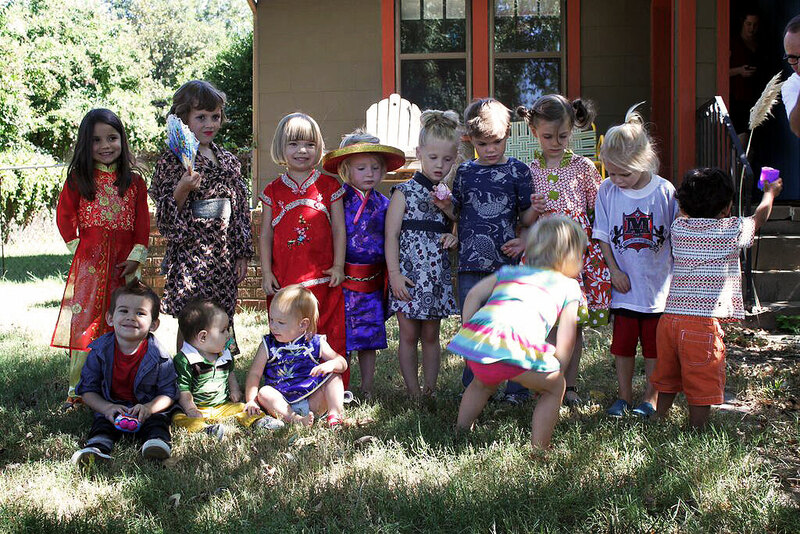 Included with the invitations were instructions to come dressed in Japanese clothes. The costumes were a big hit with the children! From the fans to the kimonos, I love them all. The girl in the black and white dress had her hair tied in a bow on top of her head – just amazing… and next to her – I love that boy’s fish t-shirt! 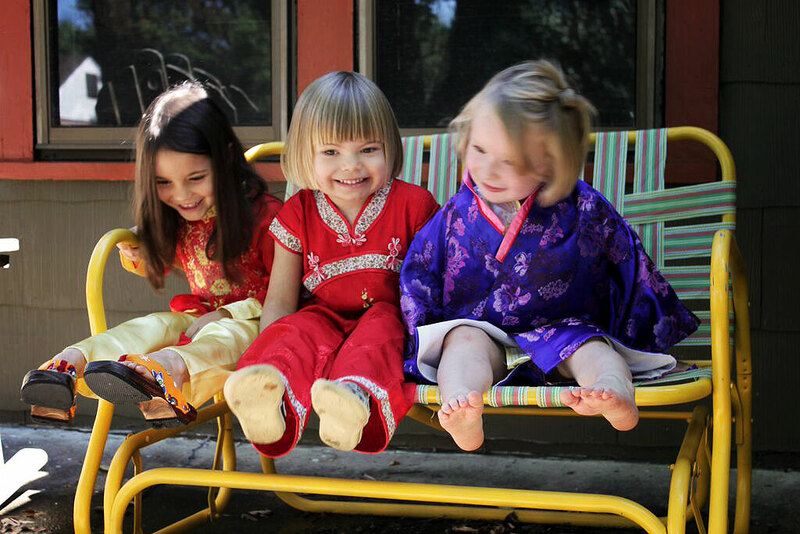 My daughter, below left, found her costume at our local Asian market… complete with wooden clogs. After the party these items were a great addition to her dress up chest! 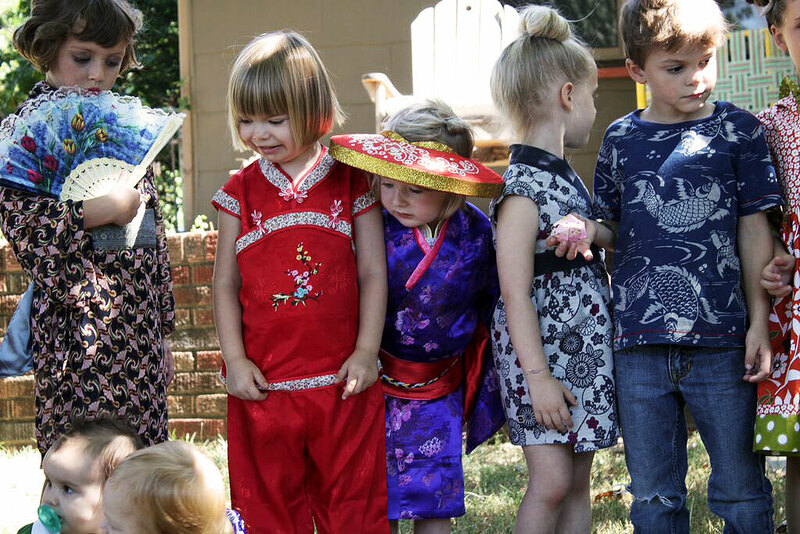 If you’re considering having a Japanese birthday party, I hope you’ve found some inspiration thanks to Annie’s fabulous Sushi Rolling Party! 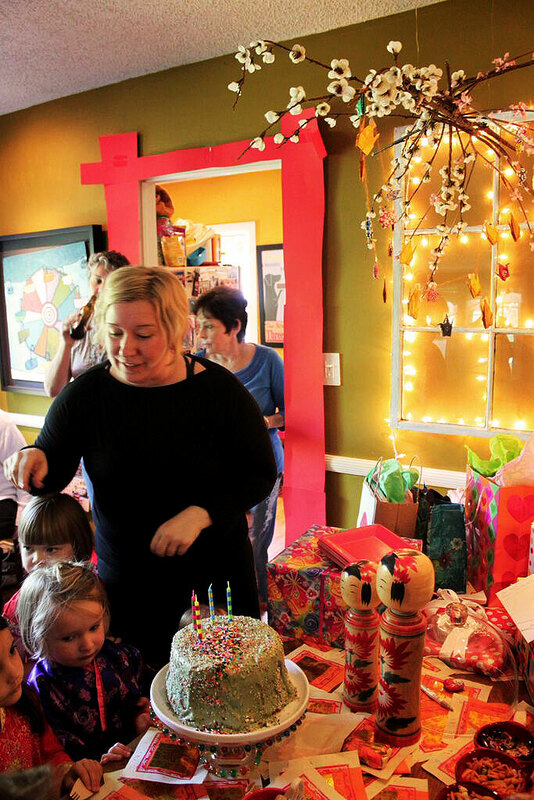 Oh, and if you’ve hosted an epic globally-inspired birthday party let me know – I’d love to hear all about it! Awesome! So festive, so inspiring, so educational and FUN! this is so cute!!! I love it! !great party idea! I bet your students love your classes. So fun! Thanks for the kind words. Ah, yes, I love the Tea Collection. So pretty. The poky sticks, they are long strips of chocolate cookies, they are Devine!